The Features Wizard is a quick way to create a BigFix Install and Uninstall tasks with the minimal amount of information about the windows feature to be specified. Download the content using the BesAll link. You must be logged in to use this feature... Registration is free! If you're downloading features individually, you'll also need the DISM Inventory Task and Upload Task. Import the downloaded bes file. Launch the "DISM Inventory" task targeting all endpoints. (this will generate the DISM.txt results file which all the fixlets trigger off from) It is a good idea to run this task as a policy which executes every night. I have pre-configured the task to do this automatically. Browse the relevant install and uninstall fixlets to get an idea of which features are enabled on your endpoints. Example Use: I want every windows endpoint I sit down at to have the Telnet Client installed. Using the "Install Feature: TelnetClient" task, I deploy as a policy targeting All Endpoints. If someone uninstalls it, this policy will reinstall the feature automatically. As new versions of windows are released, you can easily update this features list by following the instructions on the import page. 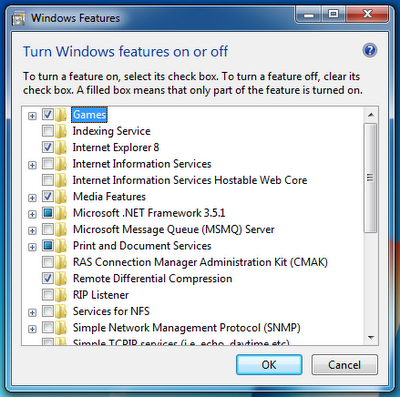 The import process will allow you to easily generate new fixlets for new windows features yet to be released.